Raymond Cusick, the production designer behind Doctor Who’s Dalek enemies, has died aged 84. He worked on the BBC TV science-fiction series from 1963 to 1966. Screenwriter Terry Nation (1930-97) wrote the episode of Doctor Who in which the Daleks made their entrance, but it was Ray Cusick who arrived at the final look, complete with eyestalk, sucker arm, and exterminator armament. Daleks have remained essentially unchanged in appearance over the half-century since they first appeared, and are still the best-known of the Doctor's enemies, and have had a new lease of life since the show's 2005 revival. Tom Spilsbury, editor of Doctor Who Magazine, has hailed Ray Cusick's design as ‘timeless’, and we have to agree with that. And of course, the Dalek call to “Exterminate” has become something of a cultural meme, especially in the UK. 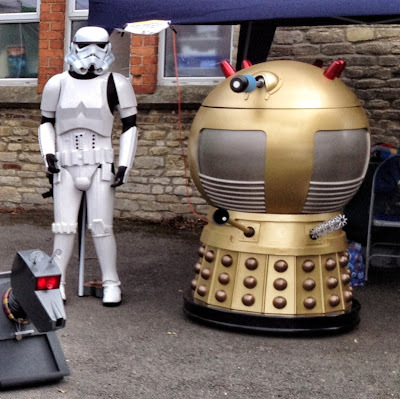 Our pictures here were taken at the 2012 smallspace model show, which featured life-size Daleks moving in the streets outside, and as you can see, Imperial Stormtroopers were out in force, and Doctor Who's robodog companion K-9 was snuffling around, too. Apart from Doctor Who, Ray Cusick worked on other British TV shows, including the cop series Z Cars, Dr Finlay's Casebook and the historical drama, The Forsyte Saga. 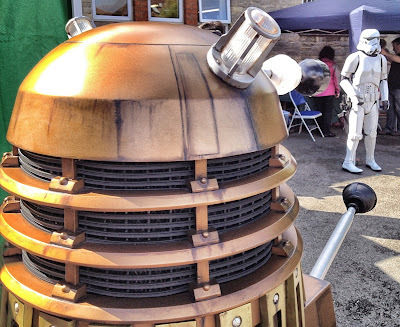 To see Daleks for real, make a date in your diary for the 2013 smallspace model show, which will be held on July 7. 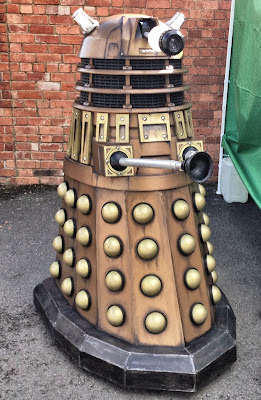 Dalek models, kits and collectibles available here.